Subscribe to Tripawd Talk Radio on Buzzsprout, iTunes or wherever you enjoy podcasts and tune in for the best amputation recovery and care tips for three legged pets, and their people. Enjoy what you’ve heard? Scroll down for your free gift! Hosted by Tripawds Blogs community founders Jim Nelson & Rene Agredano, you will hear informative discussions with veterinary surgeons, oncologists, rehab therapists and other specialist veterinarians as well as pet parents sharing their own amputation recovery experiences, treatment plans, and results for their own amazing three legged dogs and cats. Listen to the most recent 20 episodes of Tripawd Talk Radio below, or find all podcast archives on Buzzsprout. Hit the Share link to download episodes for listening offline. If you like the information shared on Tripawd Talk Radio, you will love the many other resources available to help three legged pets and their people. 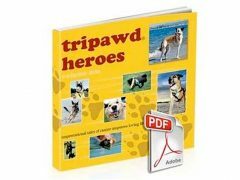 Enter your email below to receive top recovery and care tips, and immediately download your free copy of Tripawd Heroes! This fun photo book is filled with more than 20 inspirational dogs loving life on three legs. Do you have an amazing Tripawd Tale to tell about your dog or cat loving life on three legs? Are you a veterinary expert specializing in orthopedics, oncology, or rehab? Send us a short note below about why you might be a great guest for Tripawd Talk Radio.